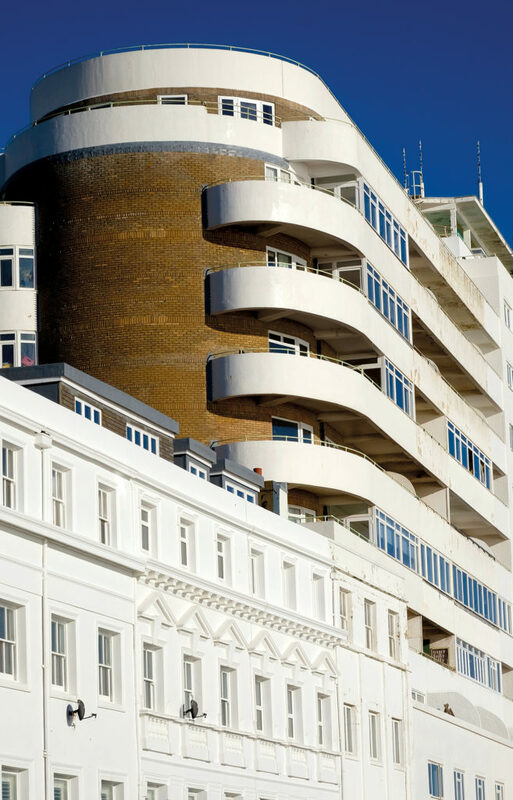 Marine Court, the vast art deco building in the shape of a Cunard ocean liner, dominates the St Leonards seafront. Erected in 1936-38 and housing over 150 flats in its 14 storeys it was, when completed, the tallest residential block in Britain. The salt air blowing in from the Channel was always going to make it high maintenance, and in recent decades it suffered serious neglect. The Grade II listing in 1999 made the costs of upkeep that much higher. However, the freehold was bought by the residents through a company, Marine Court (St Leonards on Sea) Freeholders Limited in 2010, and the prestige of the address, not to mention the glorious sea views from its upper windows, has ensured that most of the flat owners have been affluent enough, or can charge sufficient rent to sub-tenants, to meet the restoration bills as they are incurred. A glance at the addresses given for the directors of the company at the Companies Registry suggests that many have first homes in London. The 19 commercial units strung along the seafront at ground floor level have a different profile. The respective owners hold long leases, paying rent and service charges to the freehold company. Some are in business themselves; others sub-let. In the 1950s there was a smart store called Philpotts and an upmarket tearoom, Addisons; in the 1960s The Cobweb nightclub flourished. But by the 21st century the parade had become home to a low rent assortment of art studios and Bohemian fashion, officially designated as retail but with limited footfall, plus an increasing number of bars and cafes. Hastings Borough Council has striven to protect the retail element by asserting a planning policy that the parade should not have more than 40% A3 use (premises where food or drink is consumable on site, i.e. restaurants and bars). But in the modern economic climate where goods are increasingly bought and sold on-line, that looks an outdated attitude. The restaurant Half Man Half Burger, which arrived in 2015, has been a conspicuous success, substantially increasing footfall to the parade. When it applied last year for planning permission to extend its premises into the next door unit (which currently accommodates a cycle hire and repairs business), there were no local objections other than from the residential owners immediately above, who had noise concerns that the planners did not share, nor was there any opposition from conservation bodies. But the council prevaricated for five months, according to co-owner Rory Myers, and then turned it down because it didn’t accord with their policy. What were they trying to protect? Changing patterns of customer demand are one issue for the commercial owners. Operating beneath longstanding scaffolding, erected for purposes of restoration work on the exterior of the flats above, is another. The managing agents HML, with smart offices on the Waterfront at Sovereign Harbour, Eastbourne, are a branch of a nationwide property management business. They service both the residential flats and the shops and bars below. The feeling in the street is that they do the bidding of the freehold DFLs (down from London) with regard to restoration and upkeep of the flats, but have no interest in maintaining a fair relationship with the scruffy commercial elements at ground level. Whether that’s so or not, they enraged commercial owners and sub-tenants in September 2016 by giving only 24 hours’ notice before erecting unsightly scaffolding along the parade which remained in place for around a year. Meanwhile massive hikes in service charges have been imposed. Current controversies centre on the cost of works to upgrade a series of shared toilets at the rear of the premises with enhanced fire precaution measures including smoke alarms. The shops, which don’t need to provide toilet facilities for their customers, make sparing use of them; on the other hand, they are essential to the bars and restaurants, which do. Either way the projected cost of almost £100,000, charged in advance on the basis of estimates, is widely regarded as completely out of proportion to what is necessary or reasonable. But a recent meeting with the agents produced no meeting of minds. “We don’t object to paying a fair sum”, one commercial owner told me. “But at every turn of the discussion the agent referred to ‘Grenfell’ as a conversation stopper. That’s not reasonable – this building is all concrete”. None of the commercial occupiers, leasehold owners or sub-tenants, wished to identify themselves as spokes-persons for the general dissent. 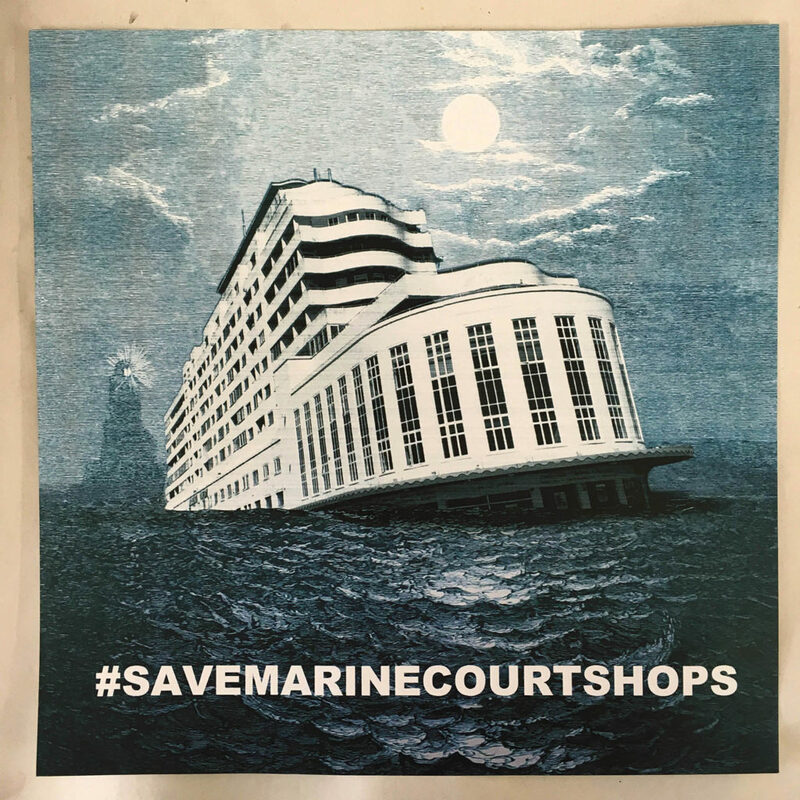 But several have stuck on their windows a well-crafted poster (there is no shortage of local artists and illustrators after all) of a cruise liner foundering in heavy seas with the tag-line #SAVEMARINECOURTSHOPS. Some are said to be taking legal advice on how to challenge the extent of the charges being levied. Others have simply left. There are several shopfronts now boarded up, which is having an adverse effect not just on general morale, but on the footfall which most of those who remain depend upon. Extending west beyond the 19-shop parade is the Burton-style Marina colonnade. Here several retail fronts have been left derelict and boarded for years. The concern is that Marine Court could go the same way. This really is a very poor piece of journalism! The article is so badly reasearched and is full of complete inaccuracies that should have been fact checked before the article had been published. I would invite the journalist who wrote this to check facts and retract this article or at least correct it immediately. I am at a loss to understand how a newspaper that has the word independent in its name could write such a biased and suggestive article that implies that the people who own and live in Marine Court are wealthy “down from London” types who can afford the high service charges. Simply not true ! If it were not for all the residents contributing to the restoration of the building and the shops, Marine Court would be in a far greater state of disrepair. It costs a lot of money to maintain this building and it is not public funds that pay for it ! I live in the building ! A brief response from the writer Hugh Sullivan. SH: If you believe that the article is “full of complete inaccuracies”, it would be more helpful to us and our readers if you would set out what they are rather than making a critical attack on my professional integrity. I don’t question your particular viewpoint as a resident of Marina Court. However there are over 150 flats in the block. Some of the owners, and some of the residents, are no doubt wealthier than others. What I reported was that “most” of the owners “have been affluent enough, or can charge sufficient rent to sub-tenants, to meet the restoration bills as they are incurred”. Please explain what you think is untrue in that sentence. I went on to point out that many of the directors of the freehold company have London addresses. Is that not also true? I believe other comments in this thread have answered your questions very well. Perhaps it’s time for you to place an article in a prominent position on the web and in the physical paper correcting your article, rather similar to what the Guardian does ! I have read the article “Marine Court Seafront Retail in Troubled Times” and take issue with much of its contents. There are a number of inaccuracies in the article, which I shall detail. I have owned a flat at Marine Court for over 44 years, so perhaps I am better placed than many to comment. The article refers to “ …most of the flat owners have been affluent enough etc., “ What has this got to do with an article about the shops ? The residential flats and the commercial units at street level are two different entities, and are operated as such. Referring to the retail units at ground level, the reporter says “In the 1950’s there was a smart store called Philpotts (sic) and an upmarket tearoom, Addisons; in the 1960’s The Cobweb nightclub flourished”. Incorrect: Philpot & Sons and the tea rooms were not located in Marine Court – they were further down the Colonnade westwards along Marina, and had nothing to do with the Marine Court shops. The nightclub was located on an upper floor in what is now Hanover House, and again had no connection with the Marine Court parade of 19 shops at ground level. The reporter refers to “..the managing agents HML, with smart offices..” What has the condition of HML offices got to do with the report? 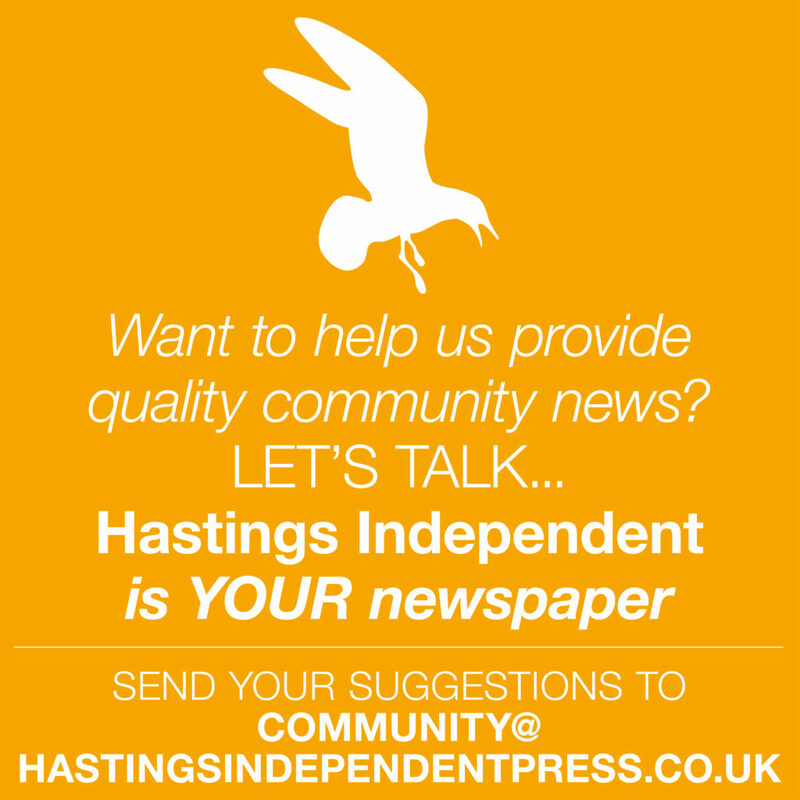 Has the reporter visited HML office in Eastbourne to proffer such an opinion? The reporter reports that the managing agents do the bidding of the freehold DFL’s (down from London) in regard to the residential flats, but have no interests in maintaining a fair relationship with the commercial units. Further down the report, the writer reports that commercial occupants are complaining about the cost of projected works, which are completely out of proportion to what is reasonable or necessary – and complaining about “massive hikes in service charges”. The two positions are incompatible – if the freehold company/managing agent had no interest in the commercial, why are projected works planned which the commercial tenants are now complaining about? If the freehold company had no interest in the commercial elements, they would hardly be implementing proposed works. The reporter refers to “unsightly scaffolding” – yes, but since when has scaffolding not been unsightly? Scaffolding was insitu for over a year, is presently insitu and is likely to be in evidence for some years to come while restoration work on the building continues. Scaffolding is essential to renovate the whole building. The writer refers to “a well-crafted poster”; beauty is in the eyes of the beholder, as they say. I have yet to meet anyone who understands what the poster message is and who the target audience is. Towards the end of the article the writer states “There are several shopfronts now boarded up”. Totally incorrect. The Collins English Dictionary defines the term “boarded up” as: “ (adjective) with windows and doors covered with boards for security. “ No shops in the Marine Court parade are “boarded up”, and it is quite misleading to have written this. Finally, did the reporter attempt to contact either the managing agent or the freehold company for their side of the story? Even if the response was “No comment” ? I suspect not. Is this good journalistic practice to give just one side of the story ? This is a badly written, biased and ill- researched article. Little wonder that none of the commercial occupiers wish to identify themselves. 1 The connection between the retail shops and the residential units above is that they have the same freehold owner, namely a company formed and controlled by a number of the residential leaseholders. 2 I take your point that most of the directors do not give their residential addresses. However the fact that the company’s registered office is in Croydon and that they identify with that office address is itself suggestive. 3 I stand corrected concerning the locations of the former respective premises of Addisons, Philpot & Sons and the “Cobwebs” night club. However my general point was that the row of retail shops comprising both the Colonnade and Marine Court once had a rather different profile. As to “boarding up”, I also accept that it is units in the Colonnade that are boarded up. However there are two or three vacant at Marine Court whose fronts are papered over – the effect in terms of morale and footfall must be much the same. 4 I am not sure what you mean by “the other side of the story” – you criticise my inaccuracies but do not advance any positive viewpoint of your own. On the other hand I do find it quite indicative that you show so little sympathy for retail leaseholders and tenants subjected to years of scaffolding blight in order for the residential flats to be restored. The restoration may well be essential from the residents’ point of view, but that does not preclude many of those retailers from feeling aggrieved. I am happy to have both sides of this correspondence published in a future edition of the newspaper, subject to space considerations which I would leave to our Letters Editor to resolve. 1. The reporter is obsessed with the location of the freehold company directors’ addresses. It is now common company practice (for obvious security reasons) for directors to give their company’s registered address as their correspondence address. How on earth can the fact that our directors’ addressees are listed in Croydon possibly be “suggestive”, as put forward in Mr Sullivan’s reply? Suggestive of what, please? Checking the Company House record of your very own publisher, HIP, I find that out of 6 current HIP directors, five give their correspondence address as the HIP registered address. Is this “ suggestive “ of something? 2. It is true that when I checked this morning three of the 19 shop windows are papered-over internally. Of these, one shop (with a long-term occupant) regularly papers-over their window for a period, presumably for window dressing. This does not indicate the shop is un-occupied or derelict. Of the two other shops, one is being re-furbished internally prior to re-opening the other is presently under negotiation for re-letting. This sort of thing happens all the time, and does not necessarily indicate a decline in the shopping area. If shop owners chose to “paper-over” their windows, then they bring it on themselves if there is an effect on morale, etc. 3. From your response, you have clearly not contacted either the freeholder or the managing agent to get their viewpoint. Should you not have done so to enable you to write a more balanced article? A serious journalistic failure, I would argue. It is no good criticising my viewpoint, when you have not contacted the freeholder or managing agent, which surely would be more appropriate. 4. Contrary to your assumption, I have every sympathy for the commercial leaseholders, as it is in the interest of everyone at Marine Court that they thrive. The restoration of the building as a whole is in the interests of all stakeholders of Marine Court – residents, shop leaseholders, and tenants. You speak of the blight of scaffolding – unfortunately this is a necessity of any restoration work and the commercial units are not the only ones who have suffered – all residents at one time or another have been “blighted” by scaffolding, loss of view, noise, dust, debris – you name it. It could be argued that residents have had much more to endure than the commercial units have. By the way, it is not the residential flats that are being restored (as you state) – it is the building itself. There is a difference. 5. In your reply you say “The restoration may well be essential from the residents’ point of view, but that does not preclude many of the retailers from feeling aggrieved”. They may feel aggrieved, but for other reasons. A point which I think is being missed is that the cost of restoration work on the residential part of the building is being met entirely by the residents themselves ( and for which the commercial units have absolutely no liability.) How can they be aggrieved at such an arrangement? You make it sound as if the residents are getting priority or some kind of advantage over the commercial, which is not the case. Perhaps we can all now move on. As a resident of Marine Court, I have had the scaffolding outside of our balcony we have been unable to use said balcony. However, like the ugly duckling story, Marine Court will be revealed and be a beautiful “swan” once again. For that, we wait paitanitly without complaining. Before works commenced, all residents, and I assume,shop owners were consulted in accordance with sexton 20. I say “assume” as I cannot confirm that, so rather than writing misleading information, as the writer of this article has done, II shall not mislead.